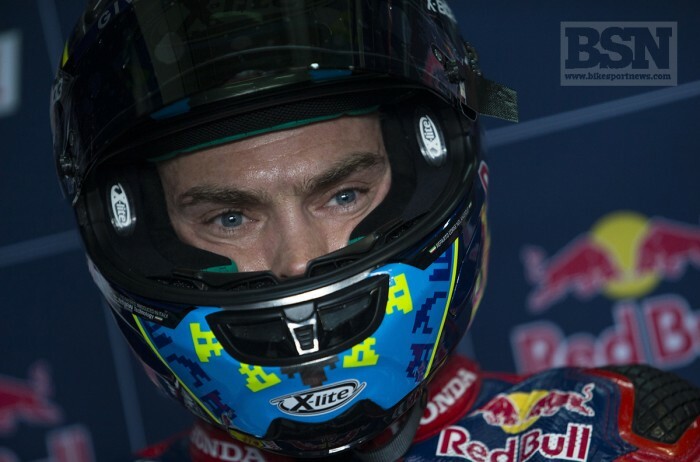 Red Bull Honda’s Leon Camier remains in Alcaniz Hospital this evening after sustaining broken ribs and a bruised lung in a big crash during the opening Aragon WorldSBK race. Camier was pinged off his Fireblade at the Spanish track, and collected Lorenzo Savadori and the luckless Jordi Torres. The Andorra resident was taken to the Clinica Mobile and then transported to hospital for more checks. Leon has been diagnosed with a closed chest injury: a fracture of the posterior ribs 9, 10 and 11 on his left side with a lung contusion. His condition is stable. Leon is conscious and in good spirits and the team would like to thank all his fans and supporters for their well wishes.